BEING BOTH an instructor and student of the game, I am fully aware there are plenty of ways to learn the game. Sometimes, you just need to get to the table to work things out by yourself. Other times, it�s a great help to have a friend or coach work with you � to offer outside perspective and/or advice from someone who has plenty of experience with the game. There�s also a nearly infinite amount of knowledge you can glean from reading books or magazines. 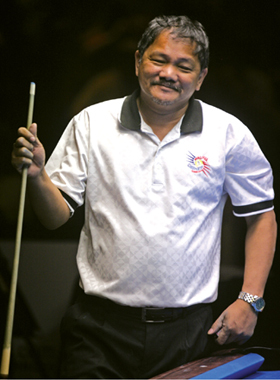 And when it comes to watching others play, you can pick up useful information from being a spectator, whether the match is between two Joe Schmoes or Efren Reyes and Francisco Bustamante. It�s important to be actively watching any match. If it�s a game of 8-ball in your weekly league, after every break shot, ask yourself, �What would I do here?� Try to guess what your teammates will do � and try to follow up with them afterward. If there�s one player who seems especially knowledgeable, try to pick his brain after matches. Try to remember specifics so you can improve your game, even when you�re not playing. Along those same lines, identify a player�s strengths and weaknesses. If you can see what someone else does well (or not so well), you will be a little more self-aware when you�re at the table. You may also see how to include a certain approach into your own game. No matter what you see in others, though, you should always be comfortable with your own game. If you perform better when you shoot slowly, shoot slowly. If two position plays are relatively similar in difficulty and outcome, go with what makes you feel more confidently. It�s important to play within yourself, no matter what skill level you are at.